This is the 10th painting in my "Fairy Wrens of Australia" series. 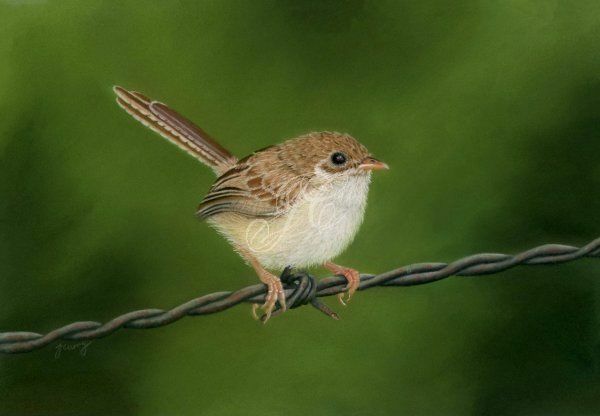 It features a female red backed fairy wren (Malurus Cruentatus) on a barbed wire fence. These delightful little birds are the smallest of all fairy wrens and are commonly found near rivers and coastal areas along the northern and eastern coastline of Australia. Two subspecies are recognised both have females and non-breeding males that are brown and cream in colour and with breeding males with glossy black feathers, the Malanocephalus of Eastern Australia has a longer tail and a more orange scarlet back whereas the Cruentatus from Northern Australia has a shorter tail and a more red back. The two regions overlap with an area of crossbreeding. Artist Quality pastel pencils and soft pastels on Clairefontaine Pastelmat. Reference photo from Robyn Jean Grace Garnet. Size is 25 x 17.5 cm. The Original Pastel Painting has sold but Fine Art Giclee Prints are available in a range of sizes.